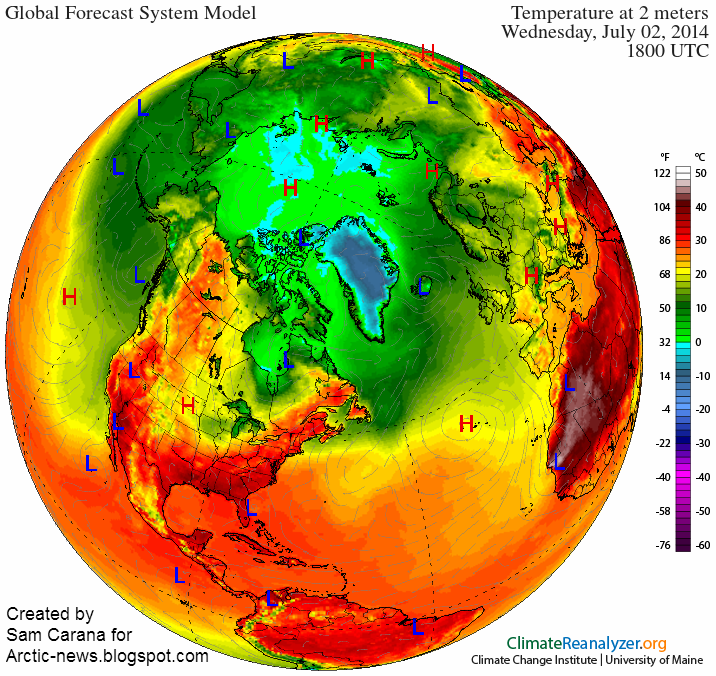 Arctic News: What's wrong with the weather? What's wrong with the weather? Above map shows temperatures in NewFoundland and Labrador close to 30°C (86°F), compared to temperatures in Albuquerque, New Mexico of only 20°C (68°F), while temperatures seem to be even lower in Mexico City. What's happening with the weather? 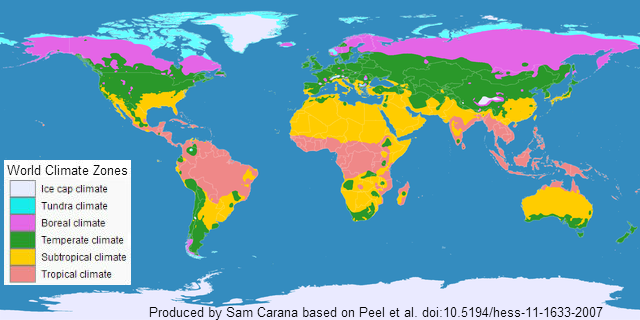 World climate zones used to be kept well apart by jet streams. 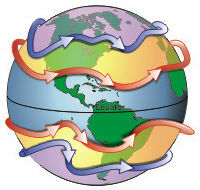 On the northern hemisphere, the polar jet stream was working hard to separate the Tundra and Boreal climate zones' colder air in the north from the Temperate climate and the Subtropical climate zones' warmer air in the south. As the Arctic is warming even faster than the Equator, the falling temperature difference between the two reduces the speed at which warm air is moving from the Equator to the North Pole. This in turn slows the speed at which the jet streams are circumnavigating the globe on the Northern hemisphere and it is deforming the jet streams in other ways as well. As above image shows, the polar jet stream is typically located at about 60°N and the subtropical jet stream at about 30°N. The polar jet stream's altitude typically is near the 250 hPa pressure level, or 7 to 12 kilometres (4.3 to 7.5 mi) above sea level, while the weaker subtropical jet stream's altitude is higher, between 10 and 16 kilometres (6.2 and 9.9 mi) above sea level. The polar jet stream used to travel at speeds of up to 140 miles per hour, while following a relatively straight track that was meandering only slightly, i.e. with waves that go up and down only a little bit. 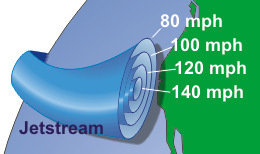 This fast and relatively straight jet stream kept climate zones well apart. Accordingly, the Northern Temperate Zone used to experience only mild differences between summer and winter weather, rather than the extremely hot or cold temperatures that we're increasingly experiencing now. 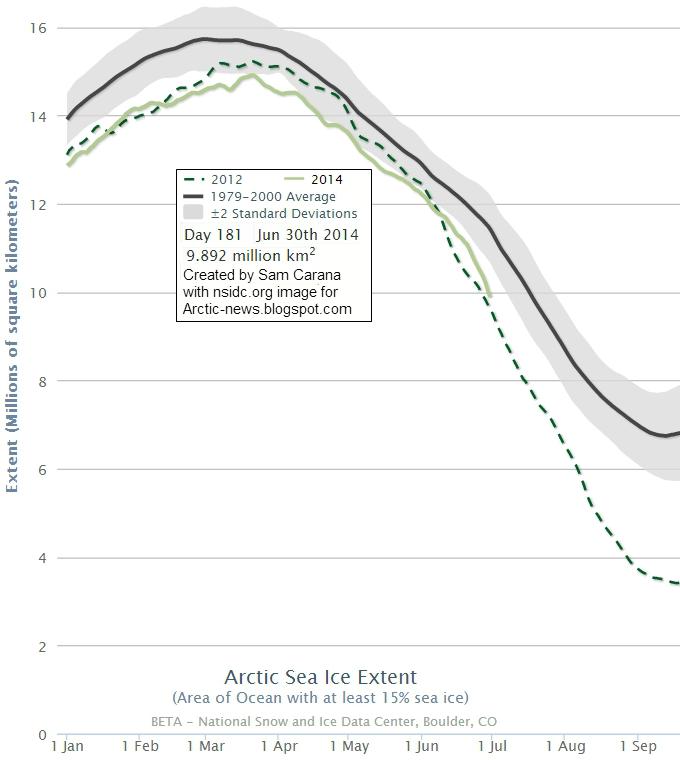 Loss of snow and ice cover in the north is accelerating warming in the Arctic. This is decreasing the difference in temperature between the Arctic and the Northern Temperate Zone, in turn causing the polar jet to slow down and become more wavy, i.e. with larger loops, as illustrated by the animation below. Imagine a river that at first rapidly runs down a narrow and straight path when its waters fall down from the top of a high mountain. Once that river flows through flat land, though, it becomes slow and curvy. Similarly, the polar jet stream is now circumnavigating the globe at slower speed and along a wavier tracks. Its waves are now more elongated, more stretched out vertically, making that cold air can move more easily down from the Arctic, e.g. through the middle of North America, as illustrated by the animation below. At the same time, warm air can move up more easily from the South into the Arctic. 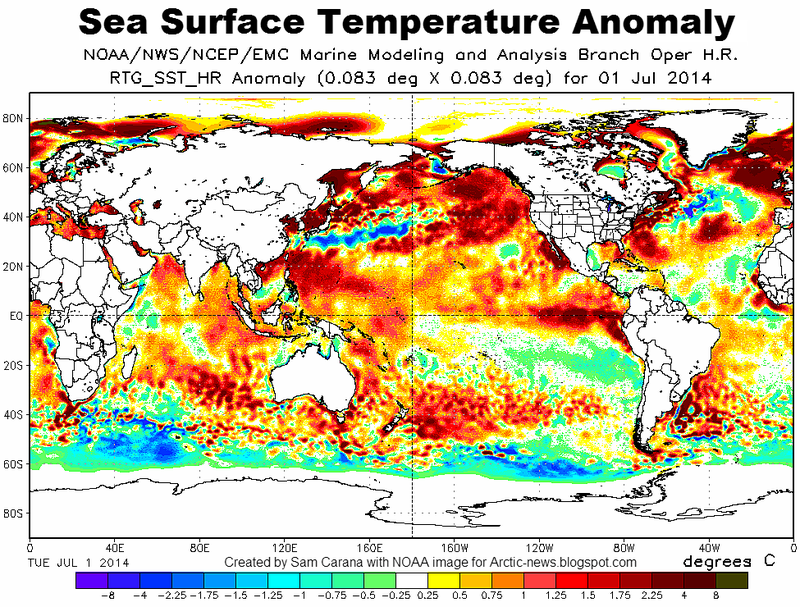 This is creating huge temperature anomalies in many places, as also illustrated by the animation below. 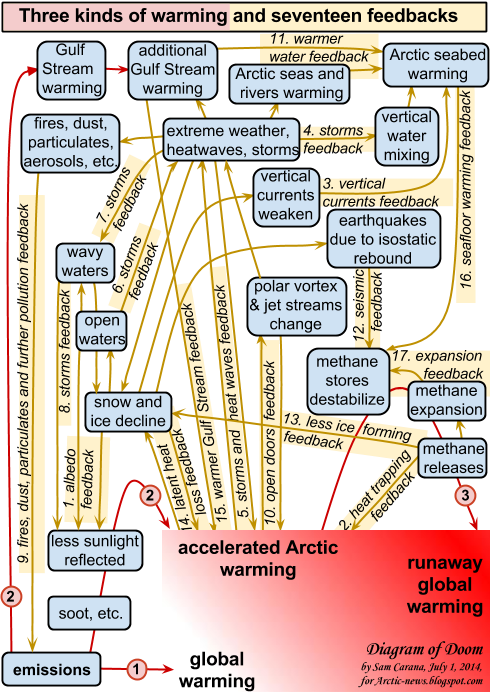 These changes to polar jet stream constitute a self-reinforcing feedback that is further accelerating warming in the Arctic. As the jet stream slows down and its waves become more elongated, cold air can leave the Arctic more easily and descend deep into the Northern Temperate Zone. Conversily, more warm air can at the same time move north into the Arctic. The result is a warmer Arctic. 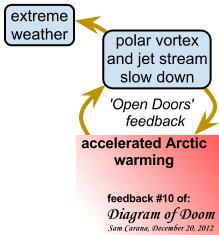 This 'open doors' feedback further decreases the difference in temperature between the Arctic and the Northern Temperate Zone, in turn further slowing down the jet stream and making it more wavy, and thus further accelerating warming in the Arctic. This feedback is pictured in the image below as feedback #10. Global warming and the numerous feedbacks have a devastating impact on the sea ice, which is currently showing an almost vertical fall in extent, as illustrated by the image below. 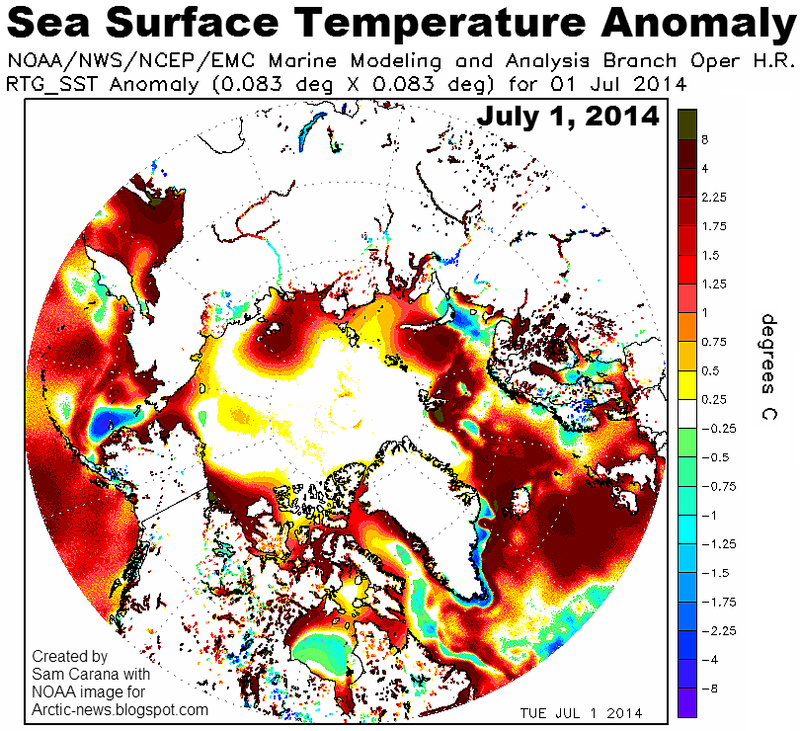 Arctic sea ice is also under threat from very warm waters. As the image below illustrates, oceans are turning red around the globe. The image below shows that where the sea ice disappears, sea surface temperature anomalies as high as 8°C and higher show up. The situation is dire, as huge amounts of methane are contained in sediments underneath the seafloor of the Arctic Ocean. Loss of sea ice means that huge amounts of heat that was previously reflected back into space will be absorbed by the Arctic Ocean. Furthermore, heat that previously went into melting the ice will also be absorbed by the water. Comprehensive and effective action is needed, as discussed at the Climate Plan blog. Excellent cross section diagram showing the positions of the cells and jets - never seen it in a way that explained it clearly - helps me visualise it all and just how important stability in those systems are to the global climate. More than 2.5m Sea Level Rise by 2040?